The San Miguel Beermen went back to basics to snap a two-game losing streak. That meant trusting their five-time MVP to carry them to a win. 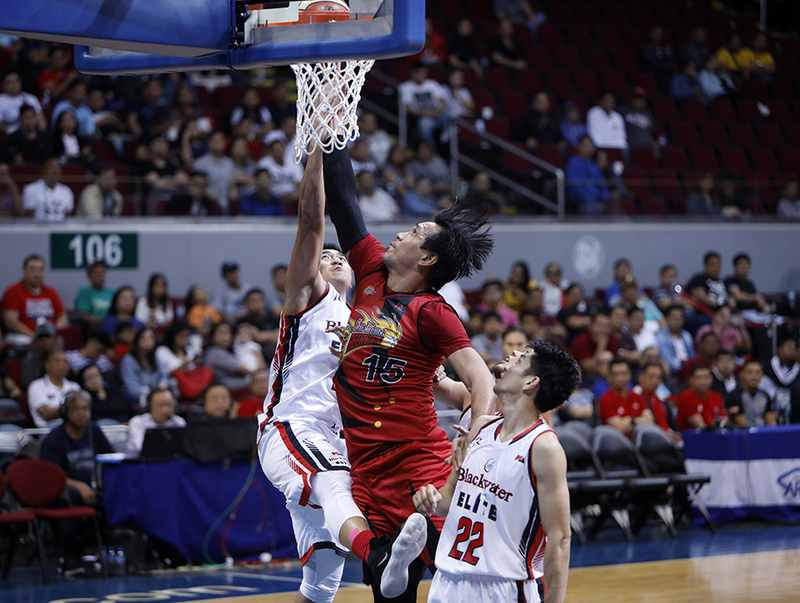 June Mar Fajardo put up monstrous numbers to lead the Beermen to a 93-79 win over the Blackwater Elite. Fajardo dominated the Elite frontline with 20 points, 21 rebounds and four blocks. Alex Cabagnot came back from injury to add 19 points and five assists. Terrence Romeo had his best game as a Beerman with 17 points, five rebounds and four assists. Roi Sumang led Blackwater with 17 points and 16 assists. The Beermen took control of the game in the third period. Fajardo and Romeo made their mark midway through the period. After Sumang tied the game at 50 with a three-pointer, Fajardo and Romeo formed the bulk of an 8-0 run to build an eight-point lead. Fajardo and Romeo continued to carry the offense to keep San Miguel ahead by a safe margin. Cabagnot nailed a three-pointer late in the third to extend San Miguel’s lead to double-digits. Cabagnot struck again with a jumper in the final seconds of the third to keep the Beermen up by 10. It was Cabagnot’s turn to carry the offense in the fourth period. He scored seven points in a 9-0 run midway through the period to increase the lead up to 21. Cabagnot scored on a layup and three-pointer and then capped the run with another drive and score. The Elite could only get as close as 14 as San Miguel held on to the win. 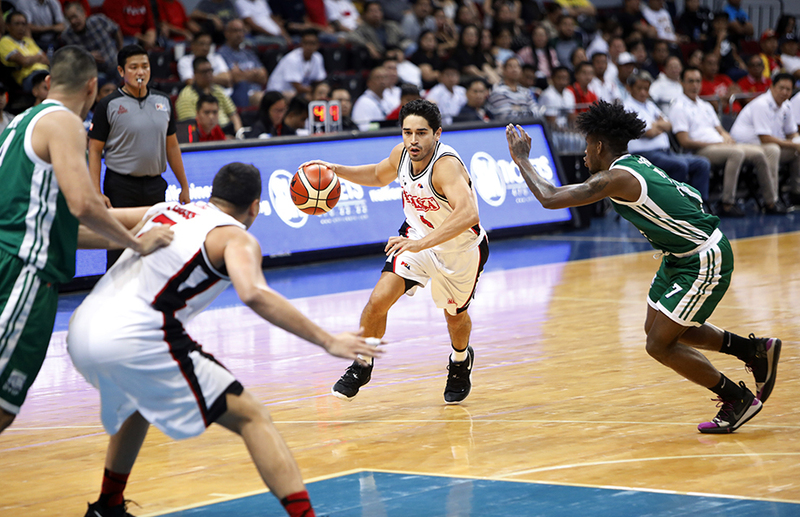 Earlier in the game day, the Alaska Aces bounced back from a loss to open the season with a balanced effort against the Columbian Dyip. Alaska won their first game 94-72 over Columbian. The short-handed Aces made sure they set the tone for the game. Their defensive effort was apparent from the get go. They limited Columbian to just 13 points in the opening period and took a seven-point lead in the final minutes of the first quarter. Alaska slowly built their lead up in the second quarter. Jeron Teng led the way with strong drives to the hoop. But he got help from Noy Baclao, Jake Pascual and Ping Exciminiano. Teng’s and-one score gave Alaska a 14-point lead and capped an 11-5 run by Alaska. Alaska settled for a 10-point lead heading into the half. The Aces pulled away for good in the second half. Chris Banchero led the run with a layup inside. MJ Ayaay scored on a jumper and Pascual followed up with back-to-back buckets to increase the lead to 15. Alaska was able to build a 21-point lead late in the fourth period with Exciminiano, Ayaay and Baclao hits. It was all Alaska from that point on Davon Potts and Carl Bryan Cruz were the clean-up committee as they kept Alaska up by a safe margin, even leading the bench mob to build a lead as high as 30 points. The Aces cruised to the win. Cruz led the Aces with 20 points and nine rebounds. Pascual had a big double-double with 13 points and 13 rebounds. Banchero had 10 points, four assists and two steals while Exciminiano added 12 off the bench. CJ Perez continues to play well with 15 points and nine rebounds.